Suzuki Side Stand Foot - AdventureTech, LLC. Worrying your bike will fall over? This bolt-on item was made at the request of and designed with the help of Strommers like you. It is fully compatible with OEM and aftermarket center stands and easily bolts on in less than five minutes. No bike needs a bigger side stand foot than the DL1000, but Suzuki left precious little room between the side stand foot and the center stand. 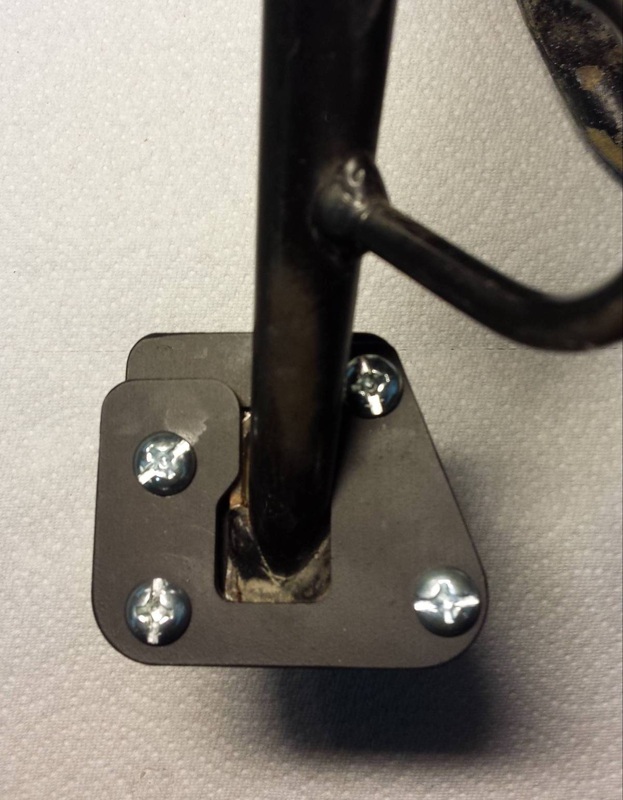 However, this bolt-on side stand foot not only clears the center stand and exhaust pipe, it increases the side stand foot print 300% and easily bolts on in less than five minutes. Need a big foot for soft asphalt or off-road duty? This side stand foot conforms to the shape of the stock foot for a secure fit. It more than doubles the side stands contact area for substantially more support. Simple 5 minute installation (probably faster).